Ships in movies and tv series come in all kind of styles. Especially when you get inside you will find all levels of comfortability, from industrial dark to the shiny white hotel style. What would spaceships really look like on the inside? First of all spaceship interior design has to be functional. Nobody cares if it looks cool or feels comfortable when it doesn’t do the job. Ships will most likely not be almost hollow shells with dozens of decks and hundreds of cabins like on cruise ships. 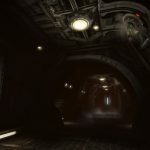 Only a fraction of the hull will be accessible by the crew via hallways, tunnels and elevators, the rest will most likely only be connected by very low service shafts, wide enough for drones and robots to crawl through. Crew members can use these shafts in an emergency, but it will be very tiresome and slow. The reason is that the internal structure of a spaceship has to compensate a lot of stress during acceleration, deceleration and maneuvers. And a lot of space will be taken up by machinery, pipes and cables, storage tanks, battery banks and much more. 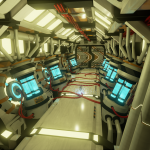 You would not build rooms and halls and than place these items inside, instead you would incorporate those components into the interior hull as much as possible without wasting space and mass. Habitats and the bridge will be much more comfortable, though. 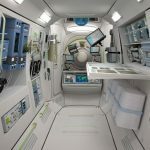 People can live in very confined spaces for a while but if you are planning to make a system trip over several months you should take care that the crew is not getting claustrophobic. Military ships and cargo haulers will probably have a simpler and more practical interior design while luxury ships could look like spacious hotels on the inside. So hallways and rooms will probably not be as confined as on a submarine but also not as spacious as depicted in flicks like Star Wars. Walls will not be covered with shiny plastic sheets or glass elements for miles, simple removable plastic covers in dull grey will be more likely, allowing access to systems within the walls. Hallways and cargo holds will allow special transport vehicles and robots to move stuff around, but the ceiling height will be rather low. Loading and unloading spaceships like ships on Earth would take forever. It is more likely that whole cargo sections will be removable in one piece while docked. They could use their own small apogee motors and actually fly themselves out of the ship and into the station. You would not want to wait until 1.500.000 liters of Neon have been pumped from the cargo tanks, you more likely simply remove the whole tank array and replace it with another one. Spaceship crews still would have to struggle with mental and organic problems connected to living in a small box.